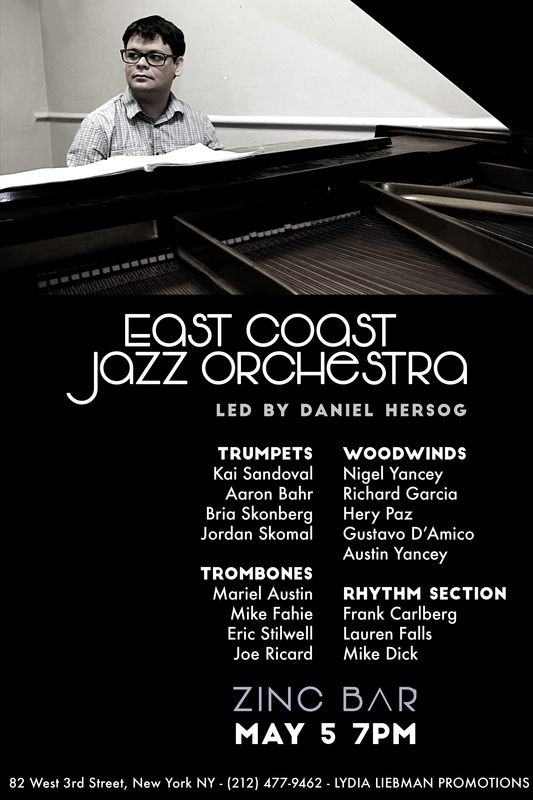 Daniel Hersog is proud to present the Daniel Hersog East Coast Jazz Orchestra on Thursday, May 5 at 7:00 PM at Zinc Bar, located at 82 West 3rd Street, New York, NY 10025. Reservations are encouraged and can be made by visiting www.zincbar.com. Hersog, who is originally from Vancouver, presently leads a sister big band: The Daniel Hersog Jazz Orchestra, which features many of Canada’s top musicians. Jazz trumpet player, composer, and arranger Daniel Hersog is an important young voice on the modern jazz landscape. Currently attending the prestigious New England Conservatory, Daniel has studied with a veritable who’s who of jazz music including John Hollenbeck, Dave Holland, Ken Schaphorst, Frank Carlberg and Rakalam Bob Moses. Daniel has also been fortunate to study trumpet with renowned master teachers John Mcneil, Ralph Alessi, and Steve Emery.